The following report was based primarily on an interview with John C. Pennie on January 17, 2005. Since then, Mr. Pennie has informed FTW that plans to erect three wind turbines on the same property as his residence have been cancelled. I have been pondering your article "Renewables Part 1" and agree with your premise. That is why we have decided to focus on 'inland clusters' (of wind turbines) servicing a local area. In Ontario, there are many small community hydro distributors, which could potentially allow for distributed rather than centralized generation of renewables. Since we last spoke, we have come to a decision concerning our three turbines in Adjala due to excessive delays and costs that we were facing through the Environmental Assessment and re-zoning process (attached). Therefore we are now focusing on two sites in other municipalities west of this location, which will be announced shortly. On April 8, 2005, Pennie was quoted in a Canadian weekly, The Banner, as saying the decision to move the project to another jurisdiction "had nothing to do with the concerns of some of the residents because we believe, as a result of our work, that there are no health issues to the public. But time is money and it is simply from a business point of view that it didn't make sense." Pennie did not respond to the following questions prior to publication. 1. Which municipalities are now being considered? 2. Will you or any of your business partners have the chance to join a wind energy cooperative once the project is complete? May 4, 2005 0800 PST (FTW): Land's End Corporation is building three wind turbines in Hockley Valley where the company's president has built his home. The aerial photograph of the township of Adjala in Ontario, Canada, below shows the president of Land's End Corp., John C. Pennie, is currently living one mile from where the proposed wind turbines will stand. FTW's research indicates that the only way to directly utilize renewable energy is to be near a renewable energy source. In a phone interview, J.C. Pennie was asked if he is aware of peak oil. "Well I've heard about it," said Pennie. "I haven't done a lot of research on it, but that wasn't the motivation for us to look at this project. I suffer from asthma. I see many friends and their children, the children more so, have asthma." "Our motivation initially was that we're going to drown ourselves in pollution if we don't do something. Somebody has to do something. I'm 65 years old and I'm going to do something, and I have a number of partners of similar age - we're going to do something." "And all of the (wind) power can't be generated along the lakes, and all of it can't be the ideal wind conditions. It has to be distributed and it has to be delivered to users who are close by." 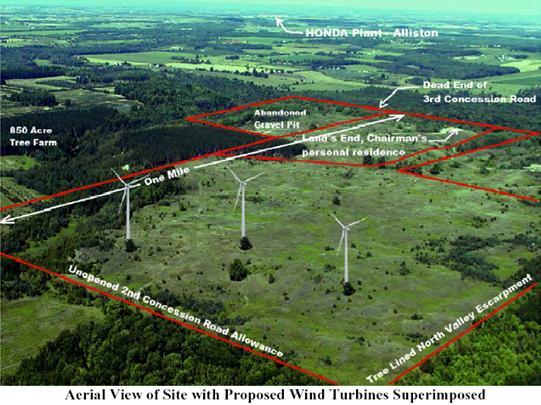 Ontario has just approved 2 major wind farms along Lake Superior's north shore,i where the wind is quite strong." But when first asked why he wanted to build this wind farm he stated, "Partly because we are concerned about the environment and partly because Ontario is short of energy." Sounds like he is concerned with hydrocarbon depletion - peak or no peak. FTW asked if he planned on using wind energy to heat his home by installing electric heating systems. Currently Pennie heats his home with propane and does not anticipate altering this. He plans on joining a wind energy cooperative with some of his neighbors when the project is completed. The property is on a plateau in Hockley Valley. Pennie explained it wasn't until construction of his home began that he realized Hockley Valley was a fairly windy area. Coincidentally, he and some partners were looking for land on which to develop a small wind farm and according to Pennie, as luck would have it, his home was well suited for such a project. "We found that the wind here made construction pretty difficult. They would be lifting a sheet of plywood and it would fly out of their hands, stuff like that. So we decided to test the property and got some reasonable results. It's not the windiest section in Ontario. But my partners and I felt - there were industrial companies in the area - that it would be a good thing for Ontario's energy if all of the windmills weren't along the lakes…so we took the property off the market to sell as real estate, and decided to work on developing it as an energy site." Land's End Corporation is made up of six individual investors, including Marilyn Fields who is president of the DAREarts Foundation for children. DAREarts has worked with NATO peacekeeping forces in a card writing campaign designed to garner donations in support of children in war torn nations such as Kosovo. As part of the larger DAREarts program, artist Mark Raynes Roberts has presented windmills as sculptural art forms - both esthetically and philosophically - to Canadian school children. Overall, the Land's End project seems to be good for everyone in the area. If this reporter had $10 millioniii to invest in such a project, he just might. What could be a better investment in the new millennium than energy security? 4.5 megawatts capacity of wind energy ensures J.C. Pennie, his wife, and neighbors who join the wind energy cooperative will have a steady stream of electricity regardless of hydrocarbon depletion and its accompanying politics. Wind fluctuation will vary, so there is the possibility of installing battery systems to store energy for when the turbines don't spin. Land's End Corporation's current project at Hockley Valley demonstrates that there are wealthy individuals who are preparing for Peak Oil - whether consciously or by happenstance. So what are you doing to prepare for peak oil? Today, some efforts to help the average citizen do appear to be in place - such as the Apollo Alliance or Set America Free - but that appearance is skin deep at best. The renewable projects they endorse cannot replace the level of hydrocarbon consumption we currently consume. Not even close. Yet the Apollo Alliance presents its information as if renewable energy projects will allow for economic growth to continue at current rates. Set America Free is an organization of war hawks who have recently -- suddenly - begun to back the implementation of renewable energy projects. Their rhetoric is that dependence on foreign oil is a threat to our "national security." Renewables will certainly make the war machine more efficient as the effects of hydrocarbon depletion set in. It's much easier to talk about terrorism than the geological reality of hydrocarbon depletion. As pointed out in Part 1 of this series and repeated here, wealthy individuals are preparing themselves while the masses remain exposed to severe scarcity in the coming years. v According to the FEC (Federal Elections Commission), American ECO Corp. had given illegal campaign contributions to the Clinton/Gore campaign as a foreign national interest. This does not appear to have occurred while John C. Pennie was Chairman.